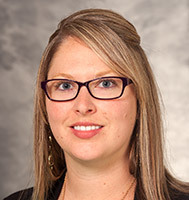 Marcella Eveler is an Advanced Practice Nurse Practitioner in the Department of Neurology. She practices on the inpatient neurology floor and focuses on the acute treatment of neurological conditions including stroke, seizures, and neuro-muscular disorders. She received her undergraduate Bachelor of Science in Nursing degree at the University of Wisconsin - Eau Claire and her Masters of Science in Nursing degree at Chamberlain University. Marcella is certified as a Family Nurse Practitioner by the American Association of Nurse Practitioners. She is very interested in improving patient care outcomes and optimizing the quality of life for patients affected by neurological diseases. She is a member of the American Association of Nurse Practitioners, Academy of Medical-Surgical Nurses, American Academy of Neurology, and the National Stroke Association.